The American Museum of Cutlery intends to celebrate the histories of past, present, and future manufacturers and bring to life these histories by way of accumulating written, oral and photographic archives as well as examples of the cutlers’ works. The Museum intends to establish itself as an important research and educational facility and serve as the premier guardian of all of America’s edged tool and weapon manufacturing history for future generations. The location of this museum is no coincidence. Within a 50 mile radius of Cattaraugus, approximately 150 different cutlery companies existed during nearly a 200 year period in our nation’s history. The location of 9 Main Street, is where knives were offered for sale when the building was constructed in 1888. Plans are underway for fund-raising and construction of a four-story museum building that will house an extensive museum collection with interactive displays. 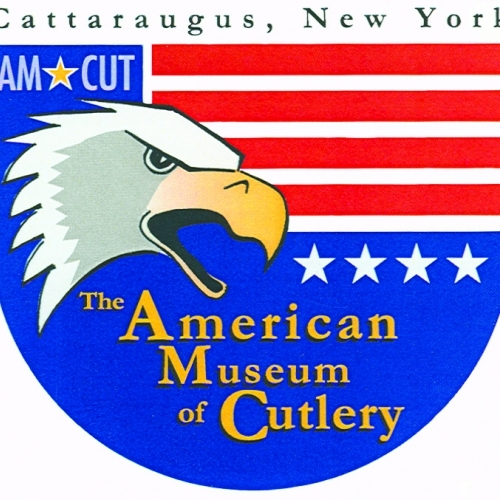 The American Museum of Cutlery seeks family and factory records as well as volunteers to assist in carrying out the museum’s mission. The museum is open on Thursdays, Fridays, Saturdays and Sundays from 1 to 4 pm. Admission is free. Groups are welcome by appointment. Donations are always welcome to support this facility. Here is a video of NBC visiting the Museum and Museum Curator, Pat Cullen. Thank you to Thomas Cullen for posting. https://youtu.be/3CoIte6Jtko.